Taco Rosa, Chef Ivan Calderon’s upscale Mexican restaurant in Newport Beach, will host its 6th Annual “Battle of the Tequileros” on Sunday, September 23rd from 4-8 p.m. Bringing together 26+ different tequila and mezcal brands, the celebratory event will benefit Operation of Hope Worldwide, a local non-profit providing free, life-changing surgeries and health care for children and adults in under-served areas of the world, while creating a self-sustaining program of hope through education. As the most diverse tequila tasting in Southern California, the event gives guests an unparalleled opportunity to experience the unique nuances between a variety of tequilas and mezcals. Guests can also enjoy tray-passed tapas-style bites from the Taco Rosa kitchen, exciting giveaways, and a silent auction. A panel of esteemed judges will determine winners in three categories: Best Añejo and Best Reposado; while guests will have the opportunity to cast votes for Best Margarita and Best Booth Presentation. 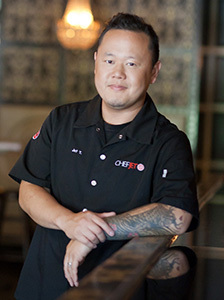 “Over the past six years, we have seen tremendous growth with Battle of the Tequileros and this year, we are proud to partner with Operation of Hope Worldwide an organization whose global reach has impacted, and even saved the lives of thousands of people throughout the developing world,” comments Chef Ivan Calderon of Taco Rosa. Tickets for the 21-and-over event are priced at $75 and offer guests all-inclusive access to tequila and mezcal cocktails and samples. Tickets can be purchased by calling 949.720.0980 or online here. Chef Ivan pulls the cork on the designer Tequila bottle with all the tempting details for us. The award-winning food bloggers from MuyBuenoCookbook.com (Yvette Marquez-Sharpnack) and SweetLifeBake.com (Vianney Rodriguez) have teamed up to create Latin Twist – Traditional & Modern Cocktails, an all-new collection of Latin-American cocktails. Yvette and Vianney are known for Mexican and Latin–fusion recipes made with easy-to-find ingredients. Their cocktails – featuring fresh-squeezed juices and homemade mixers – have been so popular that the authors decided to devote a whole book to them. Latin Twist! is the first book to celebrate the signature cocktails of 18 Latin American countries and Spain in one volume. It delves into the history of each country’s special ingredients, wines and liquors, and includes traditional drinks as well as the authors’ original recipes. There are also helpful chapters on “Setting the Bar” and using and creating the Mixers. Whether you are hosting a backyard fiesta or just entertaining a few friends, there is a drink in this book for every occasion. Try a luscious Passion Fruit Caipirinha from Brazil, Chile’s fruity Borgona, or Argentina’s national drink, the deceptively simple Fernet con Cola. There is a creative section on Mexico. Vianney and Yvette explain many other hidden creations using Tequila other than in a Margarita. Have you considered Serrano-Infused Tequila? Yvette and Vianney are our guests. Good news…No long lines and absolutely nothing to take back on this Saturday’s show. It’s just incredibly tasty entertainment for the ears with the usual assortment of great guests. Chef Jet and Producer Andy preview the show. This week we’re taking a look back and also looking forward to 2014. Hollywood, millions of redevelopment dollars later, is again a dining and entertainment hot spot and we’re chatting with the energetic Executive Chef of the historic Yamashiro about what’s new on the menu there. Our ultimate Las Vegas insider, Brock Radke, is with us talking about his favorite new restaurants of the year. What’s trending in food for 2014? Chef Jet and Producer Andy share their revealing thoughts. A Hollywood landmark, Yamashiro, celebrates their 100th birthday in 2014. If you haven’t been there in awhile it’s time to perhaps take another look. Brock Kleweno, the energetic Executive Chef and General Manager, joins us to talk about the rich history of the spot and the new commitment to fine dining in a relaxed atmosphere. There is lots more than fresh sushi to merit your attention here. If you think Yamashiro Hollywood is the spot to just take out-of-town guests for a classic cocktail and the view you may just want to change your opinion after listening to Chef Brock. Chef Brock personally does a lot of sourcing of his menu ingredients at the area Farmers Markets and actually operates a nighttime Farmers Market @ Yamashiro. May will mark their 5th year of hosting a Farmers Market there on Thursday evenings which has become quite a popular destination on its own drawing some 800 to 1,000 guests each Thursday night during the season. One of Chef Brock’s signatures dishes is a Wagyu beef steak cooked at a very high temperature on a salt rock and presented with flair at the table. It finishes cooking at the table. Other standouts are the ceviche prepared with local sustainable fish and his take on Hawaiian poke. They are also serious about the bar at Yamashiro. They prepare all the classic cocktails with style plus contemporary libations. They have some fun with the Manhattan as well as a fresh take on the Mai Tai (which was originally created in California.) They also do a standout version of the classic Moscow Mule served in the proper chilled copper mug which actually originated in Hollywood! If you’re looking for action New Year’s Eve then Las Vegas is always a festive party with real fireworks. Our insider in Las Vegas, Brock Radke, joins us to talk about the newly launched Container Park development in Downtown (with unusual shops and restaurants) along with a couple of suggestions for great New Year’s Eve dining. Brock is the Food Editor for Las Vegas Weekly. Catch Brock’s special year-end column in Las Vegas Weekly on-line naming his 13 best new restaurants in Las Vegas for 2013. The intriguing selections are both on and off The Strip! Thinking about Food Trends for 2014 ? We have…Just for fun Chef Jet and Producer Andy have put together their lists of Top Trends in Food for the New Year. Each developed their list without consulting the other. Also the items will not be discussed between Chef Jet and Producer Andy before air. That’s live radio…I’m sure there will be a few surprises. JC Clow is the standout Managing Partner of The Winery Restaurant and Wine Bar in the District in Tustin. 2014 will mark their 7th year of operation. The Orange County Concierge Association has just awarded them the distinction of “Restaurant of the Year.” The news is actually more significant than that. This is the 3rd time in six years that this prestigious award has been earned by them ! That’s a wow. If you’re looking for a non-stuffy, sophisticated and elegant New Year’s Eve celebration The Winery has two seatings that are reasonably priced and designed for the comfort of the guests. The Winery’s goal on New Year’s eve is never to pack the house! The second seating is a four course menu from Chef Yvon, live entertainment and party favors. JC caps 2013 off by updating us on the new Winery Restaurant and Wine Bar coming to Newport Beach by Valentine’s Day in 2014. It’s right on the Bay.